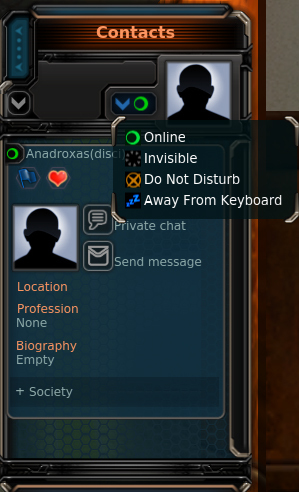 The new Version update of Entropia brought a completely new socialising interface. First i show the appearing. The whole chat system and message center was renewed. 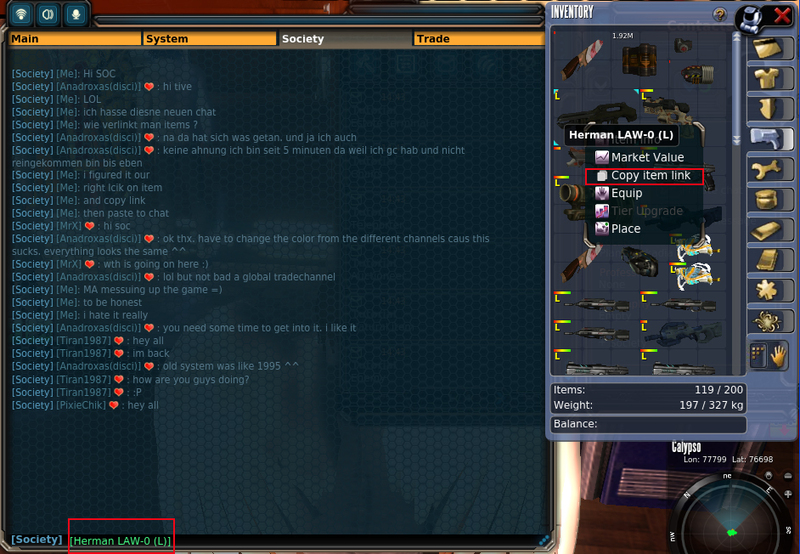 Now it is possible to link item info of items in chat, writing Messages like E-mails and spread out different channels. 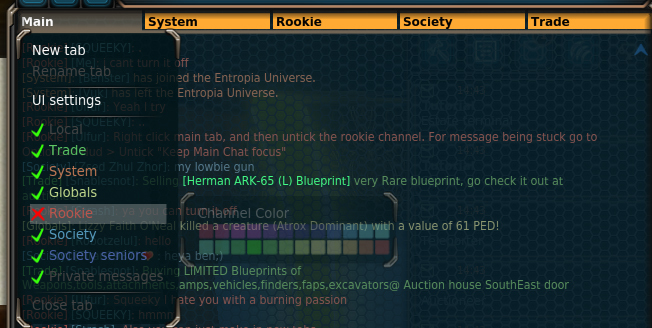 To be honest the new chat system reminds me on Eve Online. They had just a different appearing. 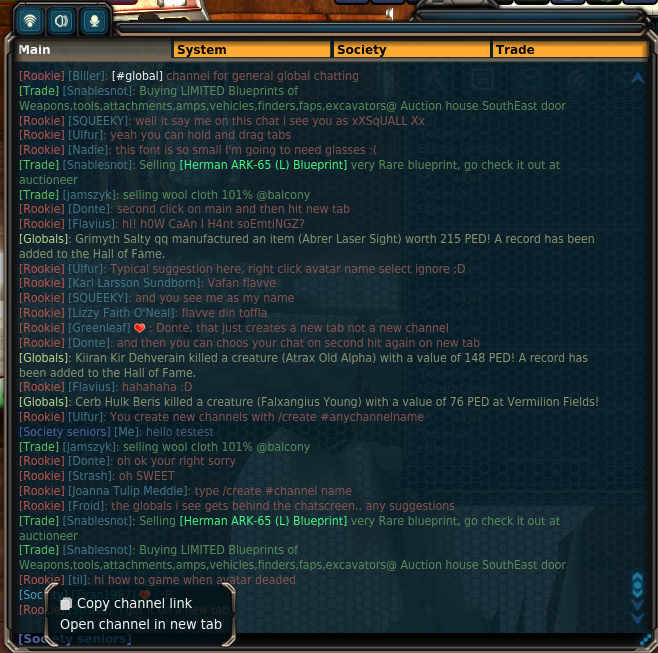 by right click on a channel name you can open it in a new chat channel tab. You can also link item info aswell now direclty to the chat. click with reight mouse button on the item in your inventory, which you wanna link to chat. Copy the item link (red marked), then go to chat window and “paste” by using right mouse button or “CTRL+V”. Seems we gonna have a lot of Link spam in the future but its for good new players. They can immediately check what items are for sale. You can mute the single channels if you go on top to main tab and right click, a small list appears and you can choose the channel you want have innaktive. The new chat system is really very complex and it will be hard for newster to find all the buttons. Features has it quite many, i think when we become used to it it will maybe be better then the old system was. This version update implemented aswell a new Messenger system which makes it now possible to send mails and make yourself some files with notes. The Friend List must be overworked by mindark , i figured already a few very not nice things on the usability. The personal profile you can edit now after this version update is worth to get a closer investigation. You can add a own profile picutre for example. After a DC i had before the society channel hang up. It’s definately a bug. Well the new system is nice, but they need to do now a bit of bugfix work. It seems aswell this standard tutorial message which everyone got are not able beeing deleted. A very big mistakes , they re really disturbing me. The Version update brought aswell some new item content, i saw some discoveries before. So head out and get them before others do !